Partnerships • Partnerships – business jointly owned by two or more persons. 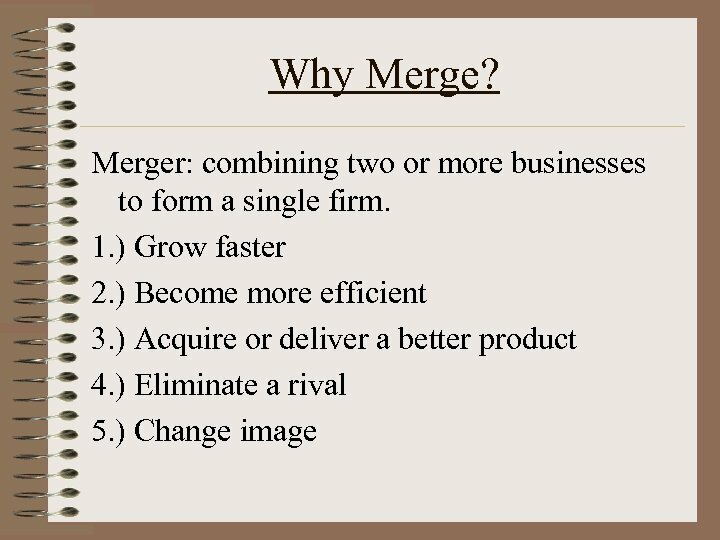 • In 2000, partnerships accounted for 7. 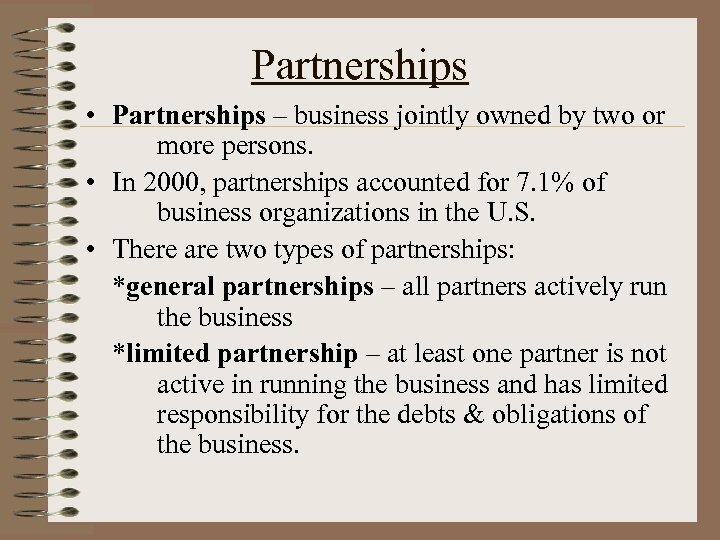 1% of business organizations in the U. S. • There are two types of partnerships: *general partnerships – all partners actively run the business *limited partnership – at least one partner is not active in running the business and has limited responsibility for the debts & obligations of the business. Forming a Partnership • It’s sort of like getting a marriage pre-nup. • Legal papers are drafted that specify: -how profits are divided. -how new partners may join. 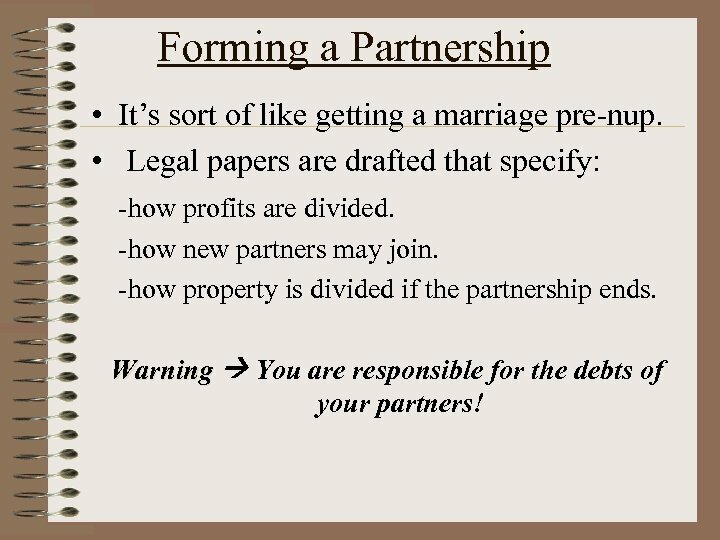 -how property is divided if the partnership ends. Warning You are responsible for the debts of your partners! 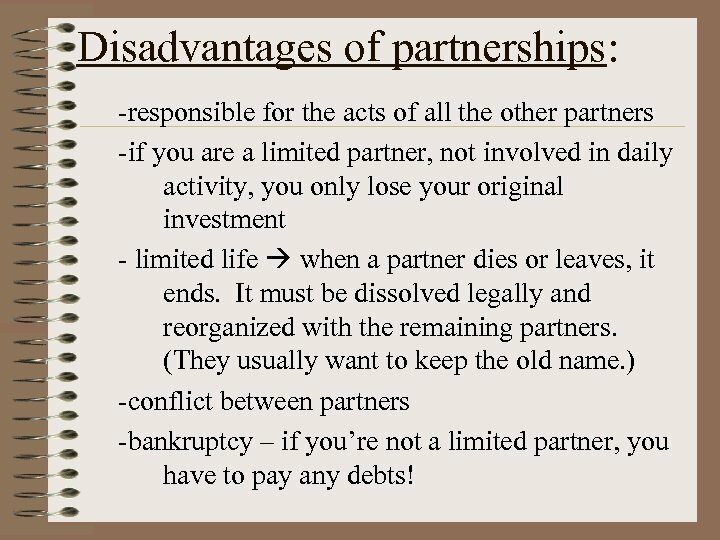 Disadvantages of partnerships: -responsible for the acts of all the other partners -if you are a limited partner, not involved in daily activity, you only lose your original investment - limited life when a partner dies or leaves, it ends. It must be dissolved legally and reorganized with the remaining partners. (They usually want to keep the old name. ) -conflict between partners -bankruptcy – if you’re not a limited partner, you have to pay any debts! 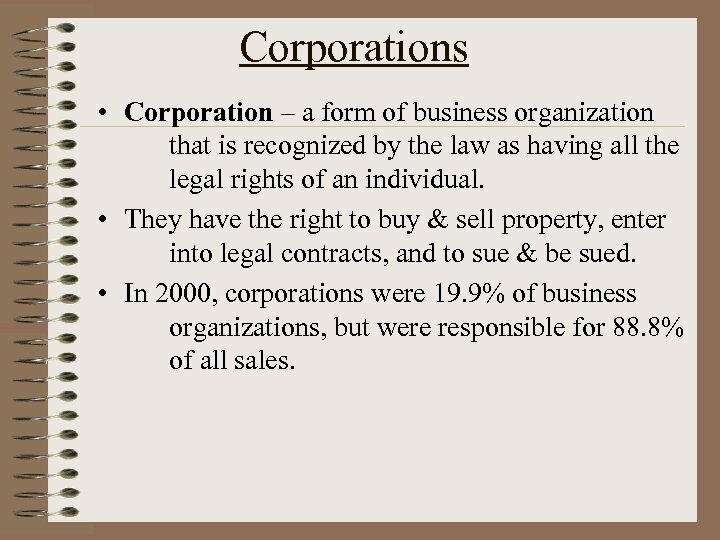 Corporations • Corporation – a form of business organization that is recognized by the law as having all the legal rights of an individual. • They have the right to buy & sell property, enter into legal contracts, and to sue & be sued. • In 2000, corporations were 19. 9% of business organizations, but were responsible for 88. 8% of all sales. Stock? 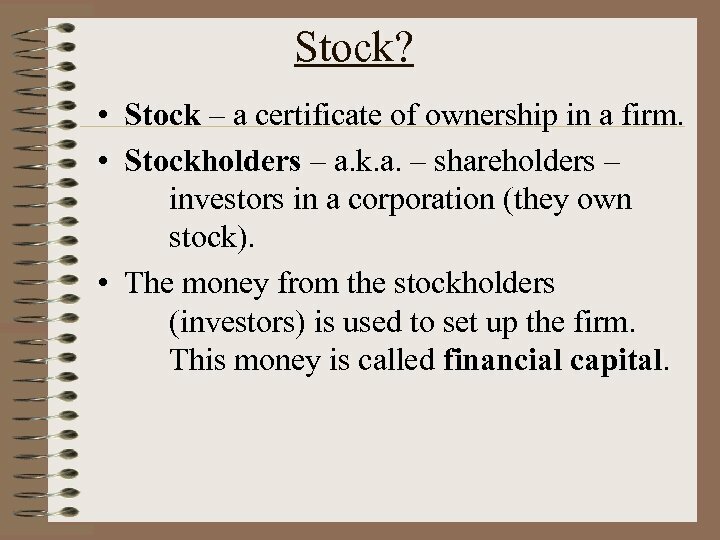 • Stock – a certificate of ownership in a firm. 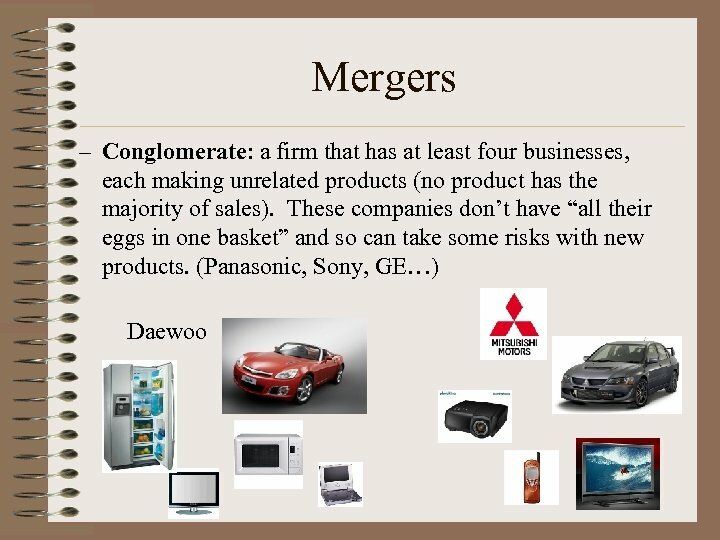 • Stockholders – a. k. a. 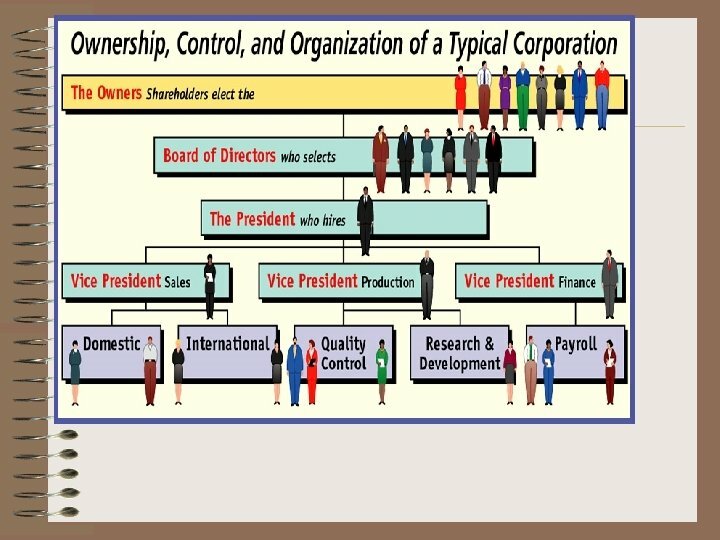 – shareholders – investors in a corporation (they own stock). • The money from the stockholders (investors) is used to set up the firm. This money is called financial capital. 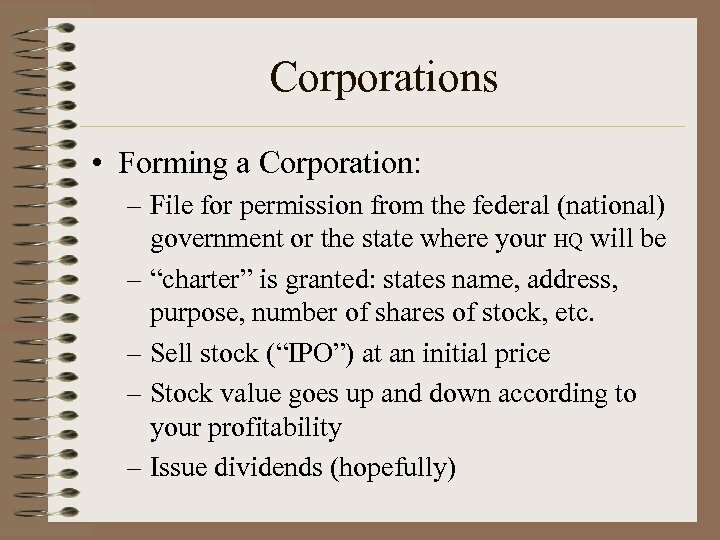 Types of Stock • Common stock – basic form of ownership in a corporation. Each share is worth one vote for the board of directors, who run the company. 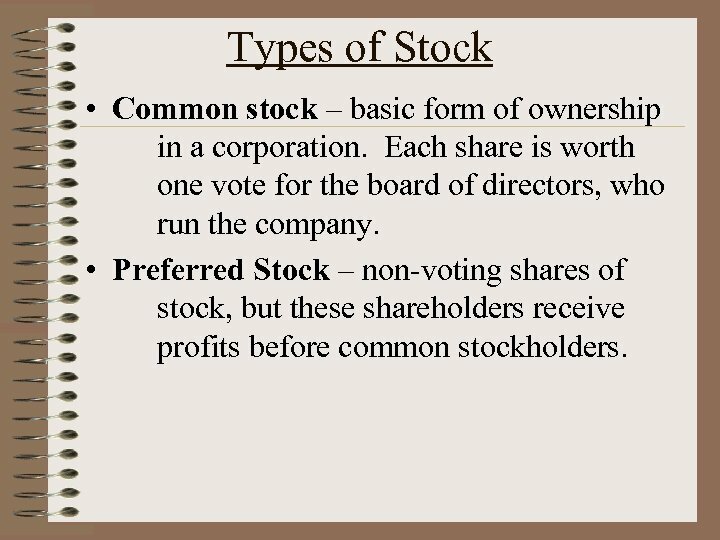 • Preferred Stock – non-voting shares of stock, but these shareholders receive profits before common stockholders. 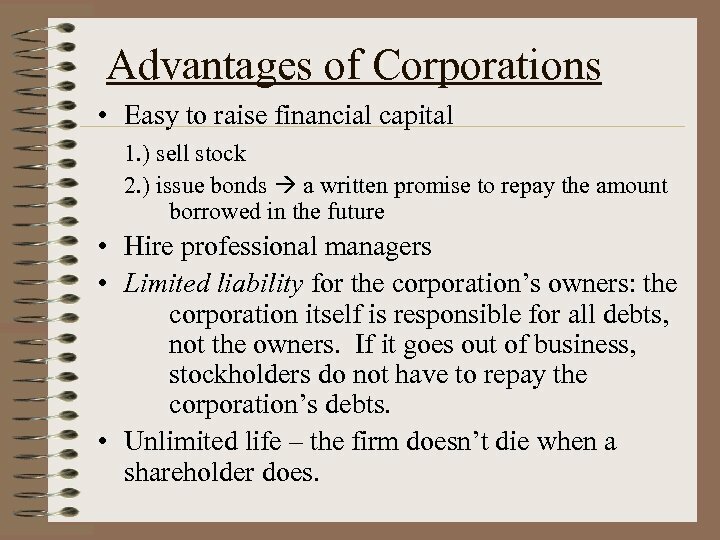 Advantages of Corporations • Easy to raise financial capital 1. ) sell stock 2. ) issue bonds a written promise to repay the amount borrowed in the future • Hire professional managers • Limited liability for the corporation’s owners: the corporation itself is responsible for all debts, not the owners. If it goes out of business, stockholders do not have to repay the corporation’s debts. • Unlimited life – the firm doesn’t die when a shareholder does. 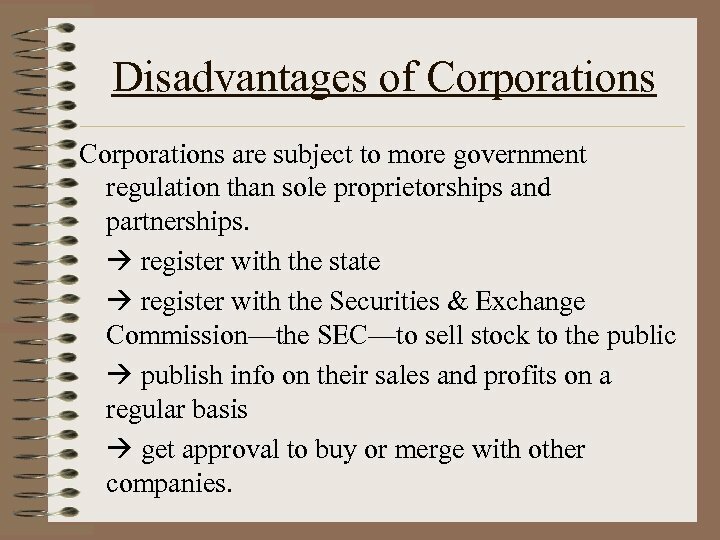 Advantages of Corporations • Ease of transferring ownership: If you don’t want to be part owner any more, you just sell your stock. Much easier than a sole proprietorship trying to find someone to buy the entire business. 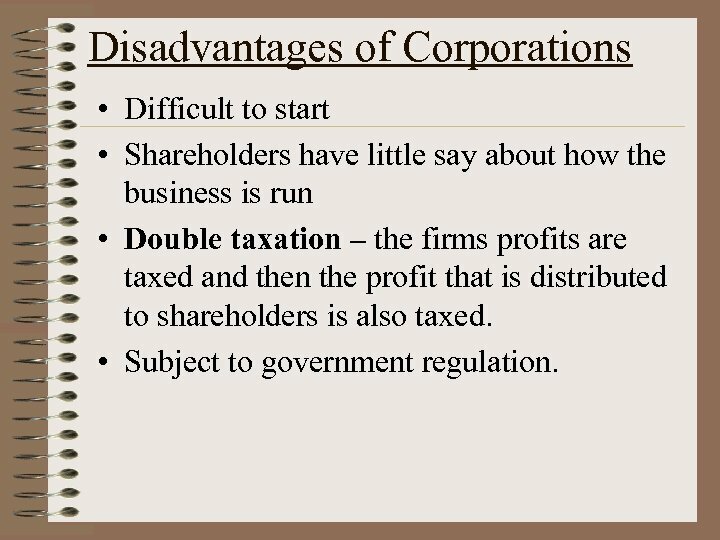 Disadvantages of Corporations • Difficult to start • Shareholders have little say about how the business is run • Double taxation – the firms profits are taxed and then the profit that is distributed to shareholders is also taxed. • Subject to government regulation. 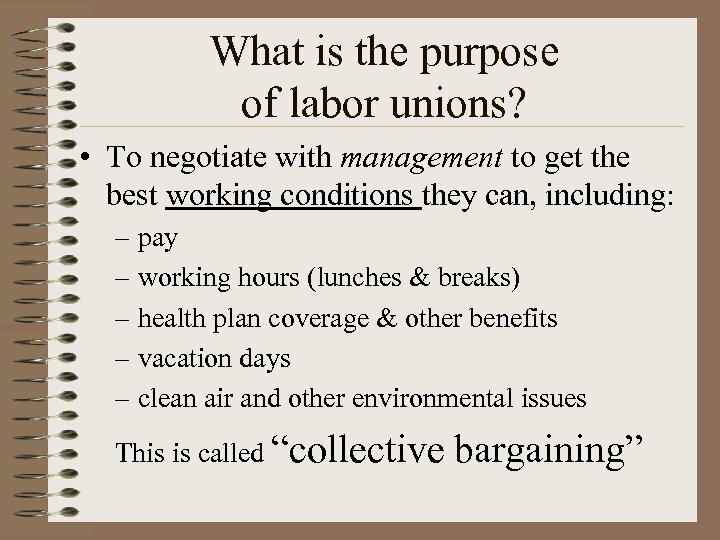 Disadvantages of Corporations are subject to more government regulation than sole proprietorships and partnerships. register with the state register with the Securities & Exchange Commission—the SEC—to sell stock to the public publish info on their sales and profits on a regular basis get approval to buy or merge with other companies. 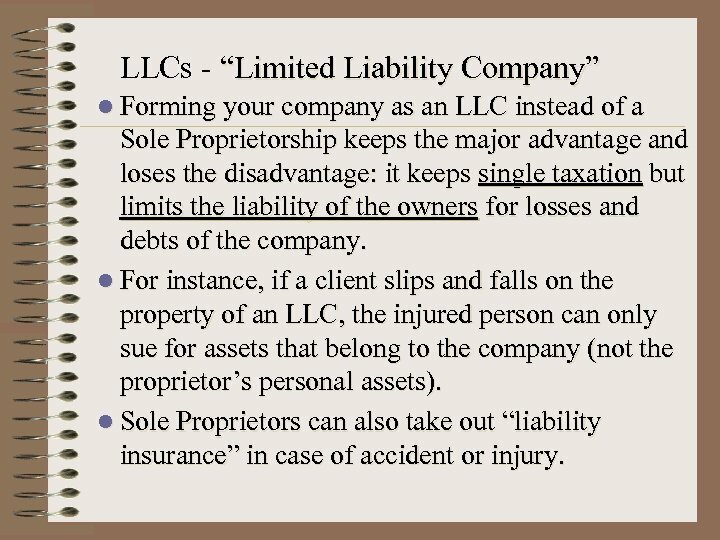 LLCs - “Limited Liability Company” q. 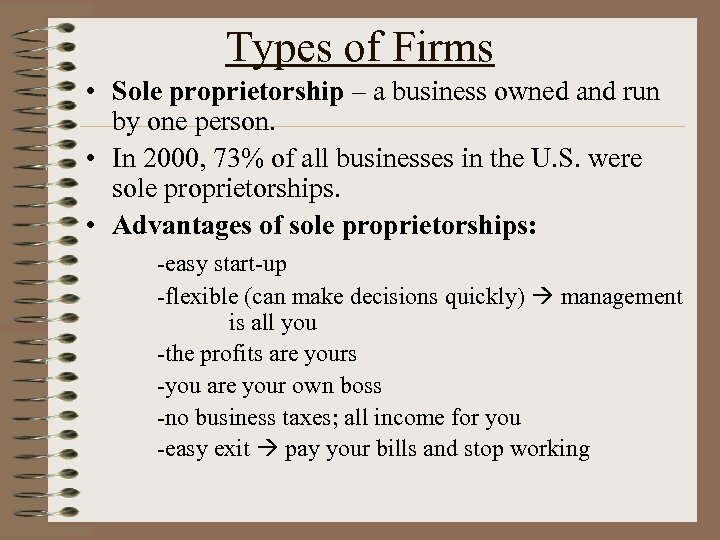 The major advantage of a Sole Proprietorship is no double taxation. 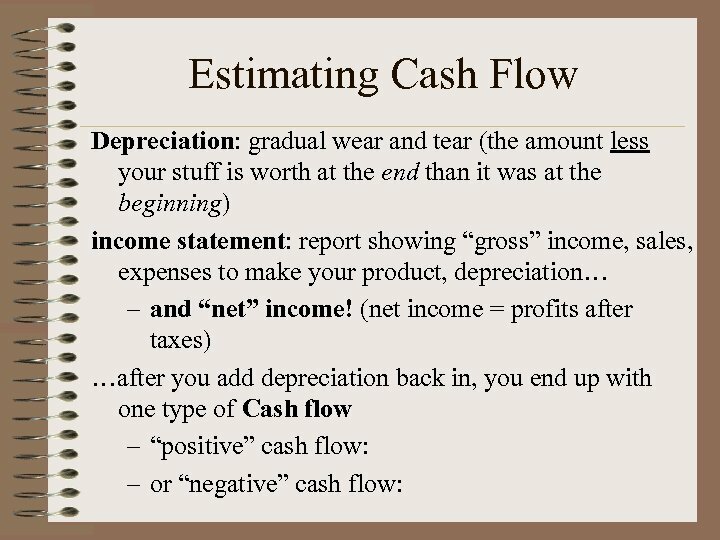 Its owner just calculates her profits and reports them as her income, and pays income taxes. q. 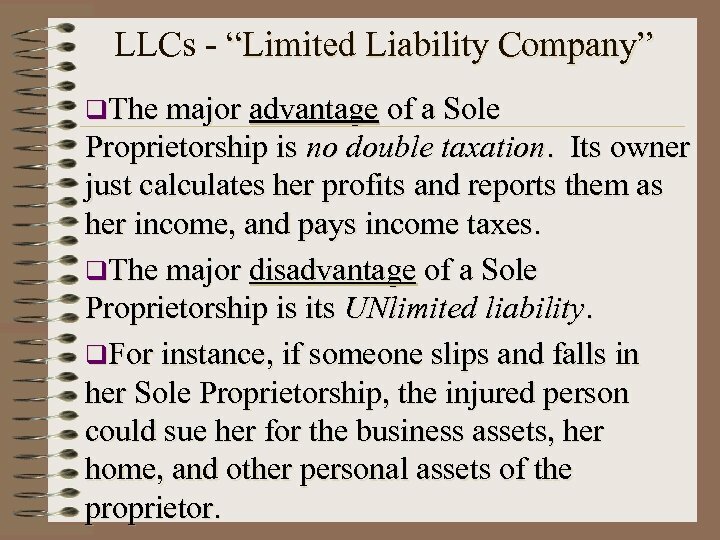 The major disadvantage of a Sole Proprietorship is its UNlimited liability. q. For instance, if someone slips and falls in her Sole Proprietorship, the injured person could sue her for the business assets, her home, and other personal assets of the proprietor. 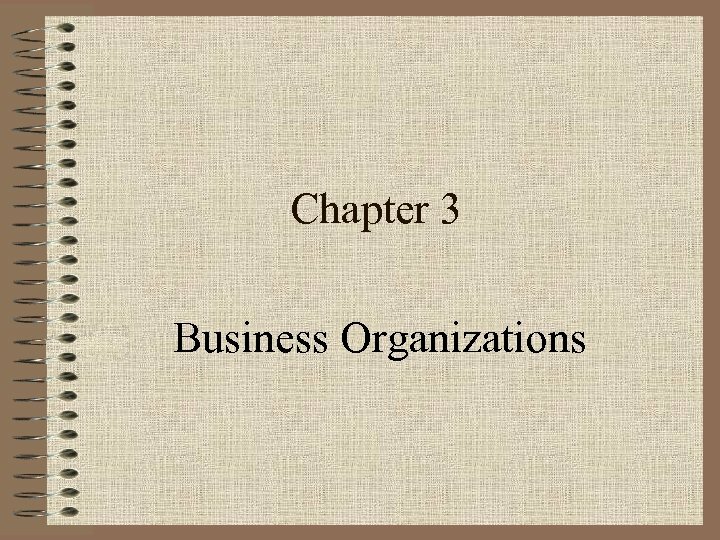 LLCs - “Limited Liability Company” l Forming your company as an LLC instead of a Sole Proprietorship keeps the major advantage and loses the disadvantage: it keeps single taxation but limits the liability of the owners for losses and debts of the company. l For instance, if a client slips and falls on the property of an LLC, the injured person can only sue for assets that belong to the company (not the proprietor’s personal assets). l Sole Proprietors can also take out “liability insurance” in case of accident or injury. 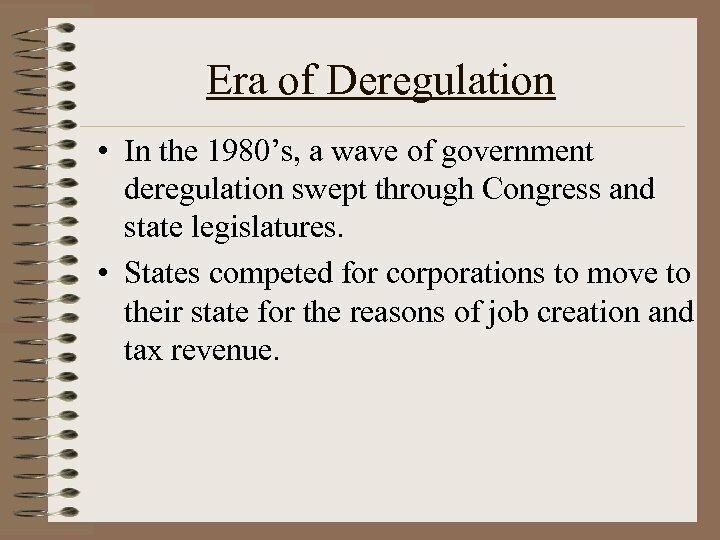 Era of Deregulation • In the 1980’s, a wave of government deregulation swept through Congress and state legislatures. 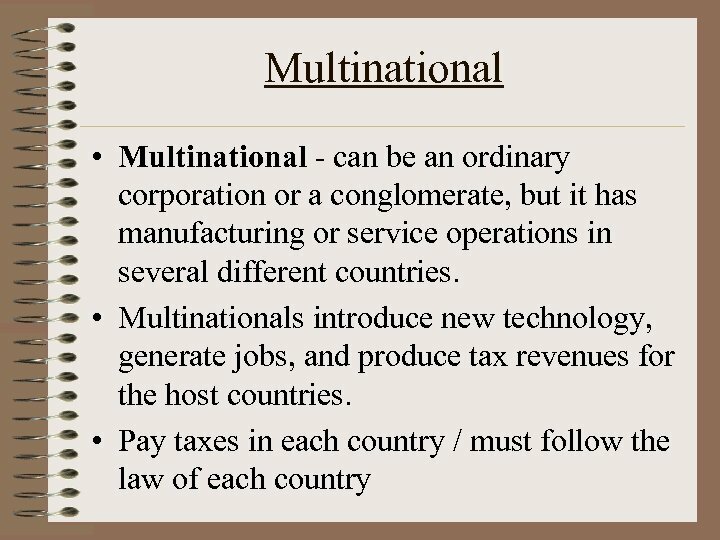 • States competed for corporations to move to their state for the reasons of job creation and tax revenue. 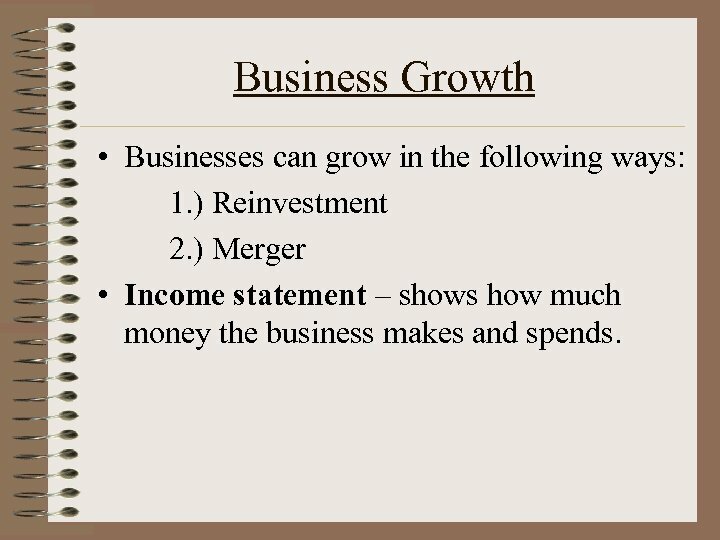 Business Growth • Businesses can grow in the following ways: 1. ) Reinvestment 2. ) 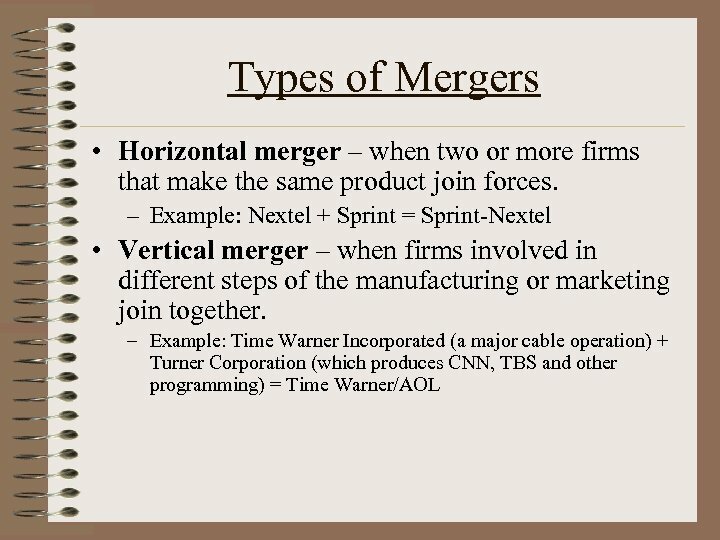 Merger • Income statement – shows how much money the business makes and spends. 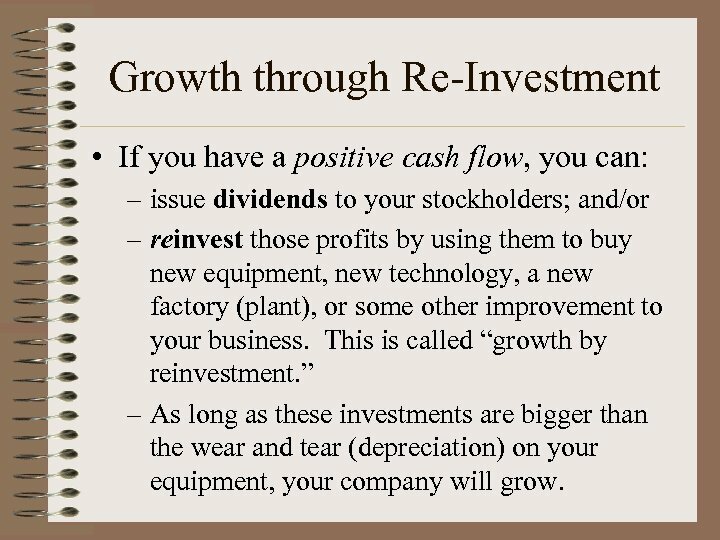 Growth through Re-Investment • If you have a positive cash flow, you can: – issue dividends to your stockholders; and/or – reinvest those profits by using them to buy new equipment, new technology, a new factory (plant), or some other improvement to your business. This is called “growth by reinvestment. ” – As long as these investments are bigger than the wear and tear (depreciation) on your equipment, your company will grow. 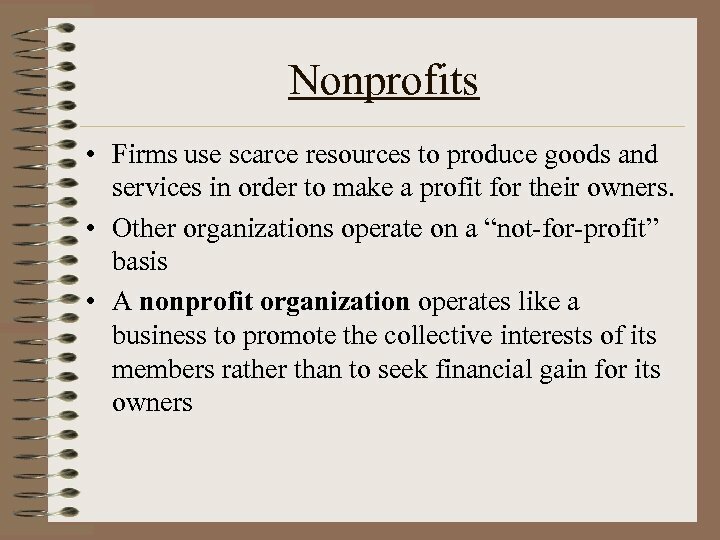 Nonprofits • Examples: schools, churches, hospitals, welfare groups, and adoption agencies. 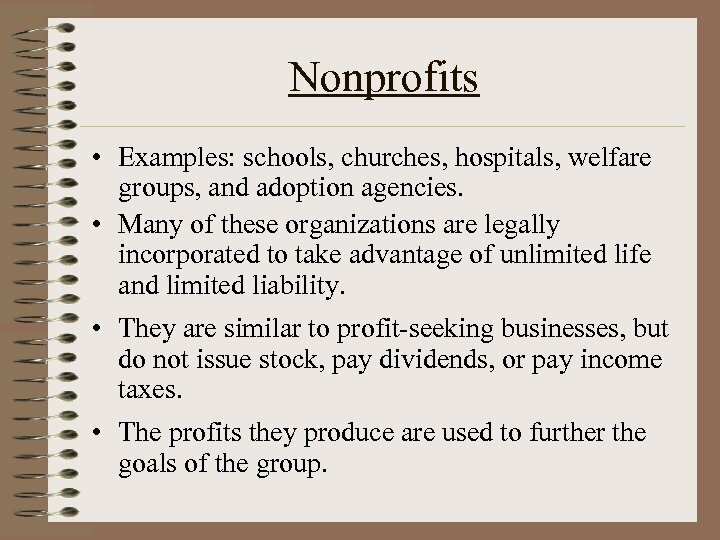 • Many of these organizations are legally incorporated to take advantage of unlimited life and limited liability. • They are similar to profit-seeking businesses, but do not issue stock, pay dividends, or pay income taxes. • The profits they produce are used to further the goals of the group. 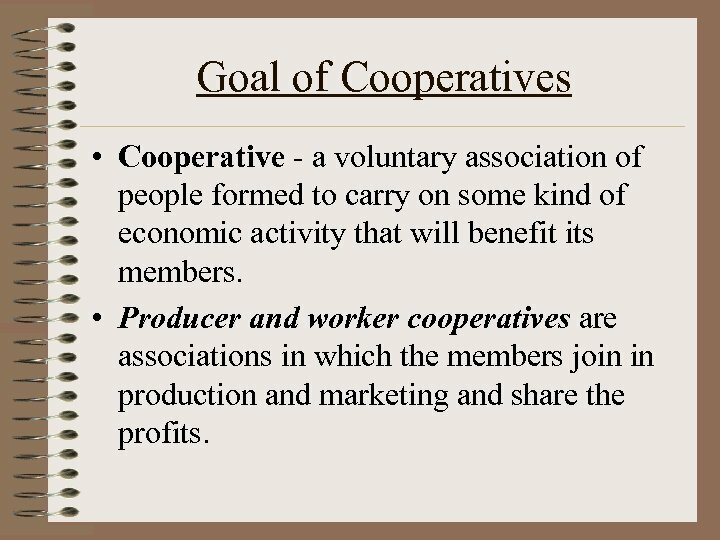 Goal of Cooperatives • Cooperative - a voluntary association of people formed to carry on some kind of economic activity that will benefit its members. 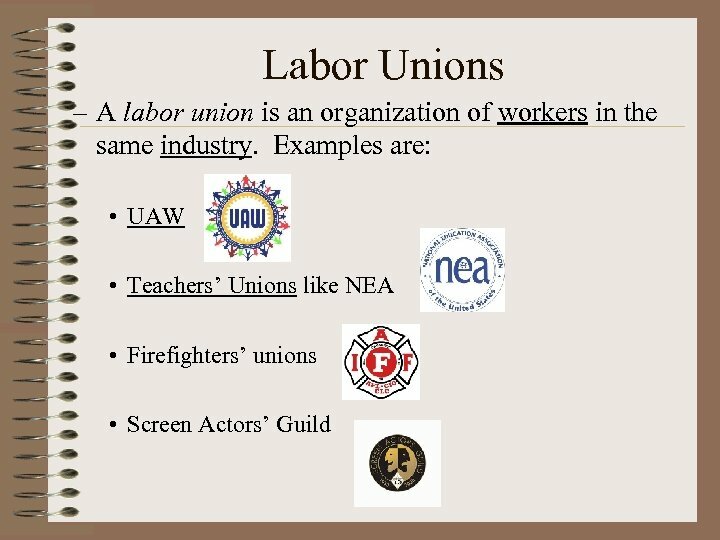 • Producer and worker cooperatives are associations in which the members join in production and marketing and share the profits. 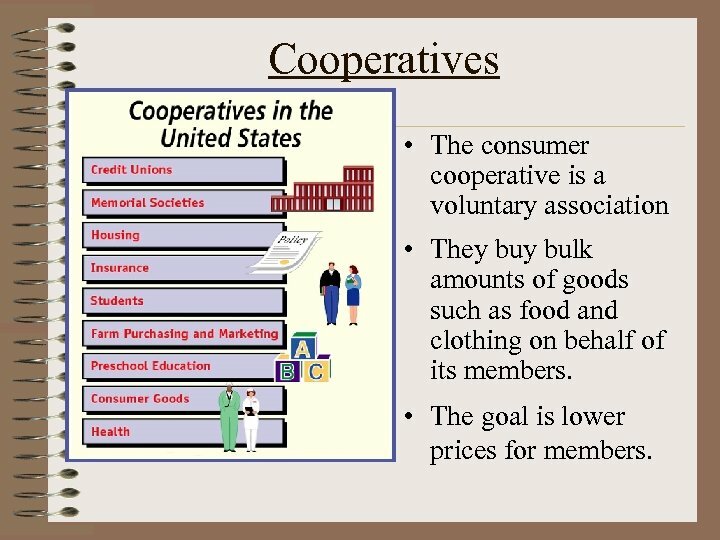 Cooperatives • The consumer cooperative is a voluntary association • They bulk amounts of goods such as food and clothing on behalf of its members. • The goal is lower prices for members. 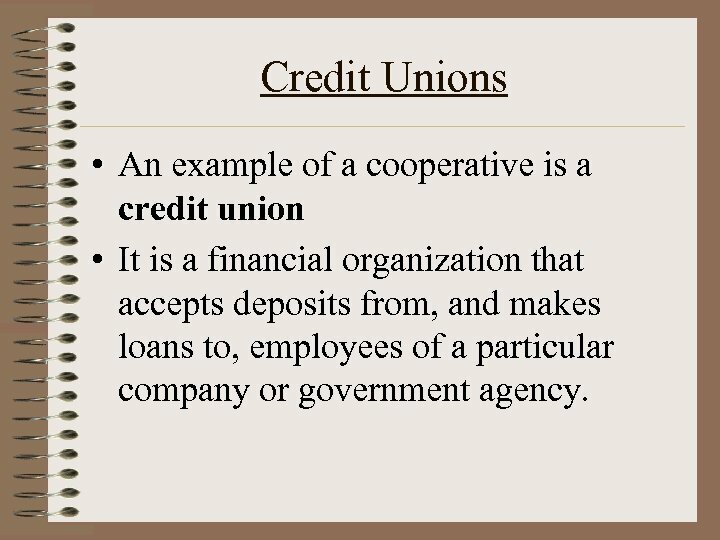 Credit Unions • An example of a cooperative is a credit union • It is a financial organization that accepts deposits from, and makes loans to, employees of a particular company or government agency. 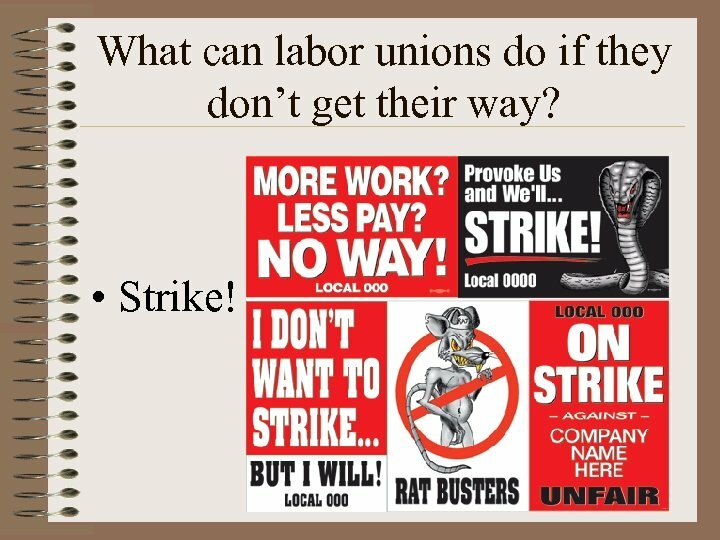 What can labor unions do if they don’t get their way? • Strike! Professional Associations • Many workers belong to professional societies, trade associations, or academies. 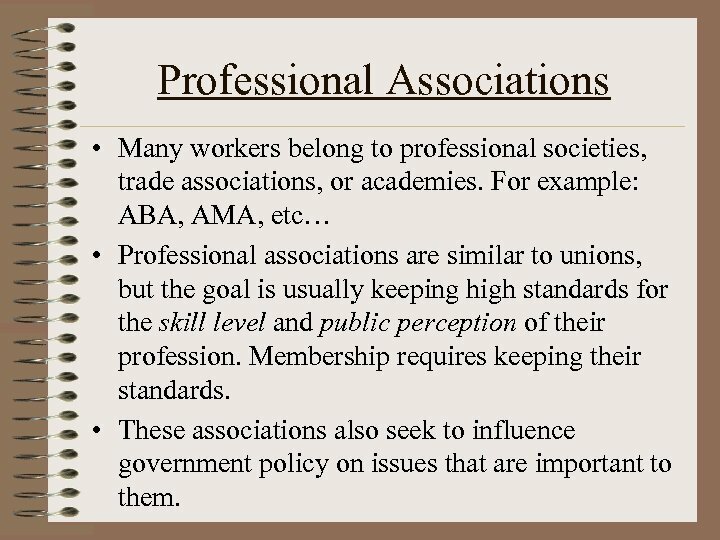 For example: ABA, AMA, etc… • Professional associations are similar to unions, but the goal is usually keeping high standards for the skill level and public perception of their profession. Membership requires keeping their standards. 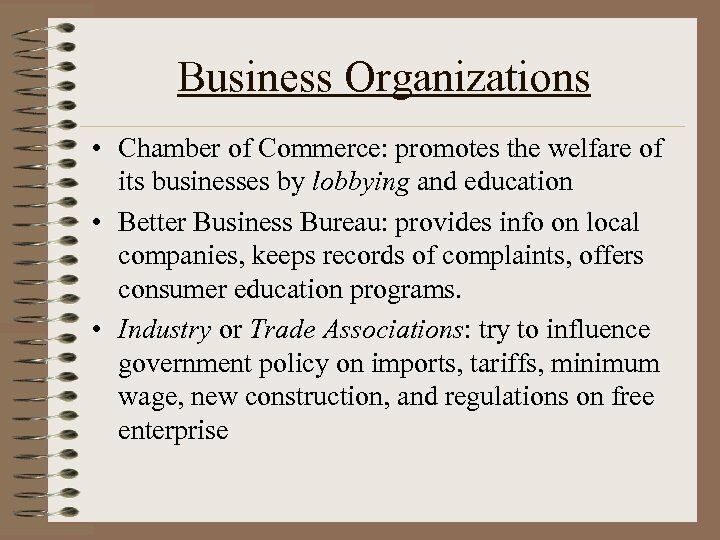 • These associations also seek to influence government policy on issues that are important to them. 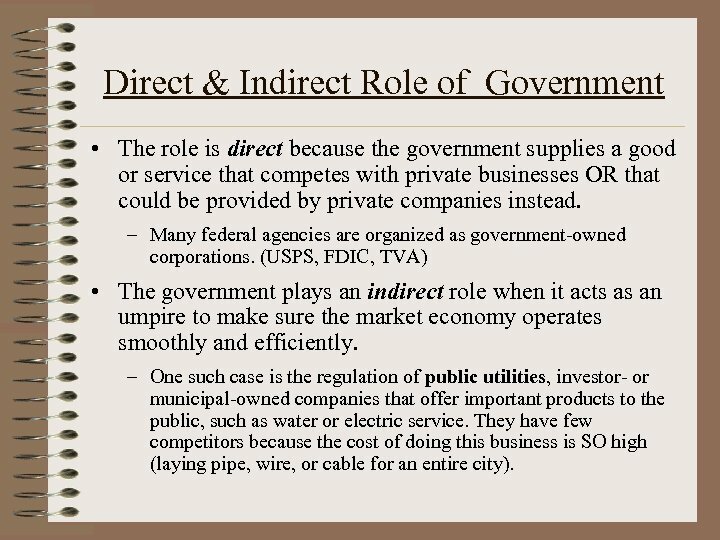 Direct & Indirect Role of Government • The role is direct because the government supplies a good or service that competes with private businesses OR that could be provided by private companies instead. 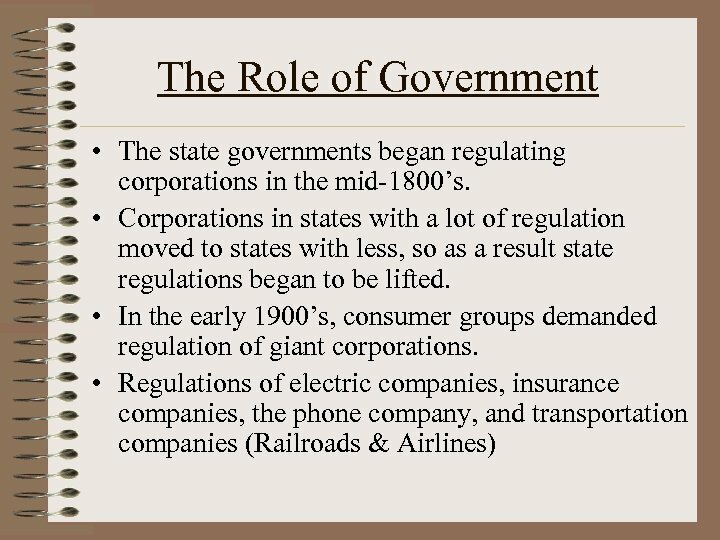 – Many federal agencies are organized as government-owned corporations. (USPS, FDIC, TVA) • The government plays an indirect role when it acts as an umpire to make sure the market economy operates smoothly and efficiently. – One such case is the regulation of public utilities, investor- or municipal-owned companies that offer important products to the public, such as water or electric service. They have few competitors because the cost of doing this business is SO high (laying pipe, wire, or cable for an entire city). One last thing! 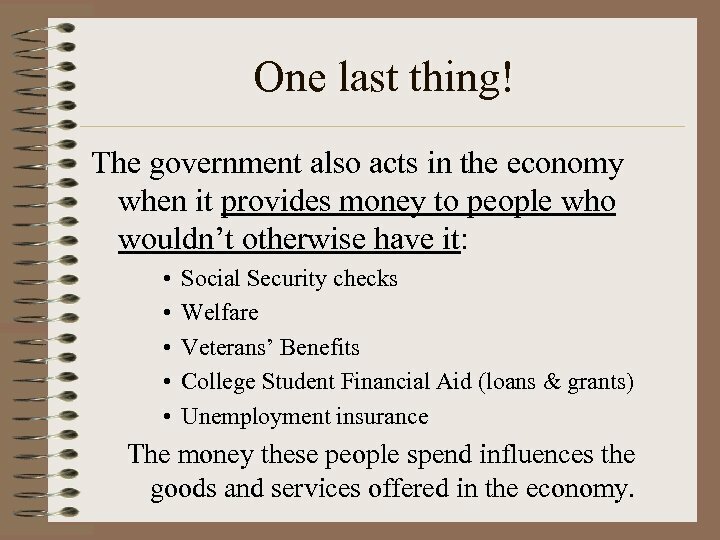 The government also acts in the economy when it provides money to people who wouldn’t otherwise have it: • • • Social Security checks Welfare Veterans’ Benefits College Student Financial Aid (loans & grants) Unemployment insurance The money these people spend influences the goods and services offered in the economy.